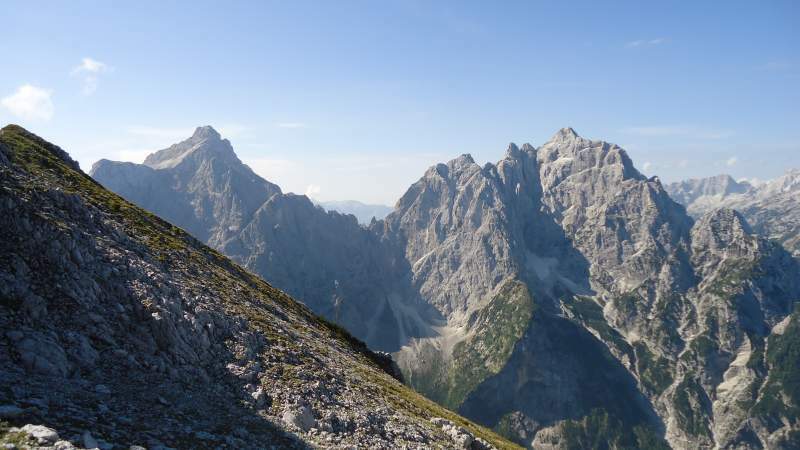 If you plan climbing Lipnica in the Slovenian Alps by normal routes, you have the Krnica route and Kacji Graben route. I have passed the former and it is described here. The Krnica valley in the early morning. Elevation: 2417 m (7930 ft). Maximum difficulty: scramble & ferrata. I have done only the former and my rule is to write only about the routes which I have passed myself, so the Krnica route is described below. But I shall be there again next summer so I might add the other route as well. 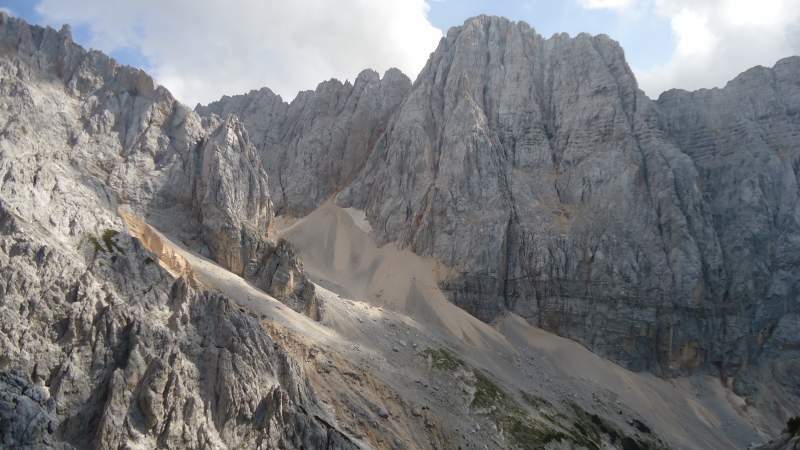 Currently, all I can say about the Kacji Graben route is that you start it just before crossing the bridge over the river Pišnica when you come from Kranjska Gora. There is a small parking area just before the bridge, and then you just continue along a gravel road up more or less parallel to the water stream. At some point, you should have the sign for the route. 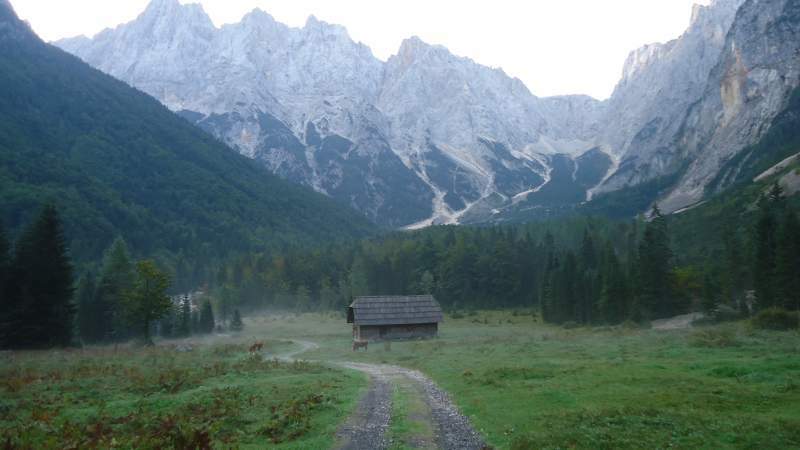 Note however that you can also continue this walk along the valley floor and arrive at the Krnica hut and then follow the Krnica route. But this would be a much longer option of the Krnica route, so better forget this option unless you want to spend the night at the Krnica hut. The red arrow – the parking space at the road that leads to the Vrsic Pass. The yellow arrow – the Krnica hut. The blue arrow – Lipnica summit. The green arrow – Spik summit. The Krnica route to Lipnica summit. 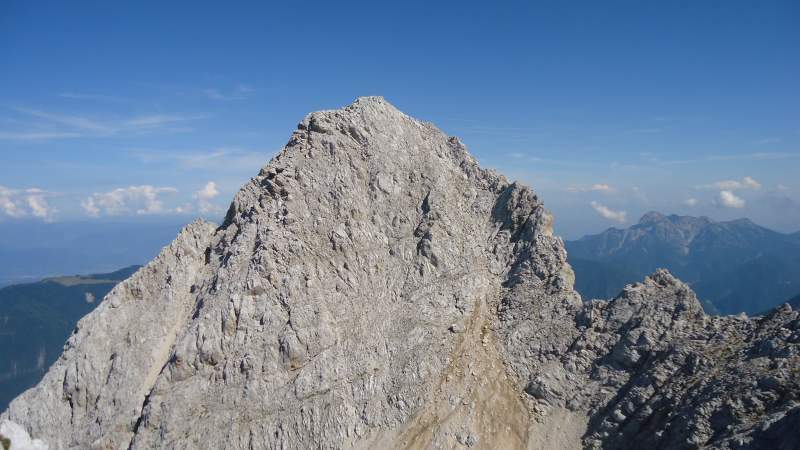 So if you continue driving from Kranjska Gora (instead of parking before the bridge as described above), a few hundred meters before the Russian Chapel you will see a cross on the rock on the right side of the road. This is the place where you should park. This is not a parking, but there is enough space by the road. On the left side of the road, you will see the signs to Krnica and Krnica hut and Kriz. If you would be coming from the south (from Bovec area), you would go over the Vrsic Pass and then descend towards Kranjska Gora. After the Russian Chappel, you would get to the start point. So leave the car and descend by following a dirt road, and soon you will be on the valley floor and you will pass the place where you have water, see the picture. 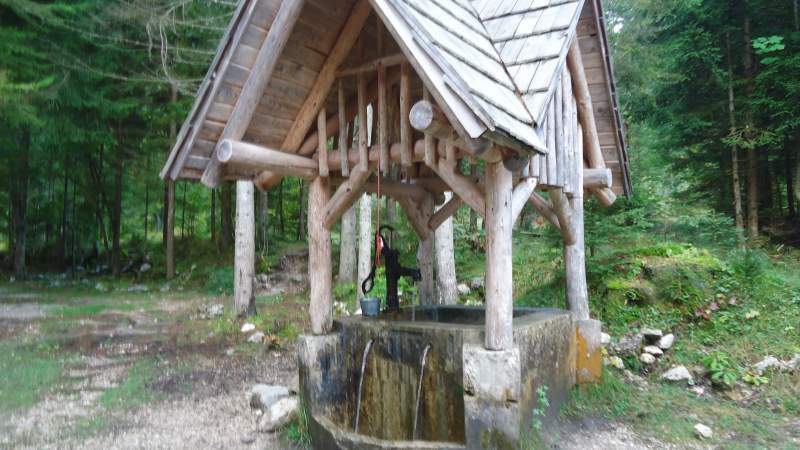 Do not miss to refill if you do not plan to stay at the Krnica hut. In the summertime, you will not have water anywhere else on the route. This is the place for water supply. It will take you some 30 minutes to rich the Krnica hut, see below how it looked for me in the early morning. At this point, you are ar 1113 meters above the sea, so as you realize the valley is deep and you have 1304 meters to climb. This is far from easy so do not underestimate this relatively low mountain. Note that it is much higher if you would follow the other route mentioned above, it starts far lower in the valley. There are signs at the hut so take the route to Spik. The Krnica hut (Koca v Krnici). Obviously, I was following the route described above. But this was after driving overnight from Belgium and without a minute of sleep. Crazy I know but this can’t be helped. So I started at 7:15 am and I was on the summit around 12:20. This includes also some 15 – 20 minutes spent at the hut. 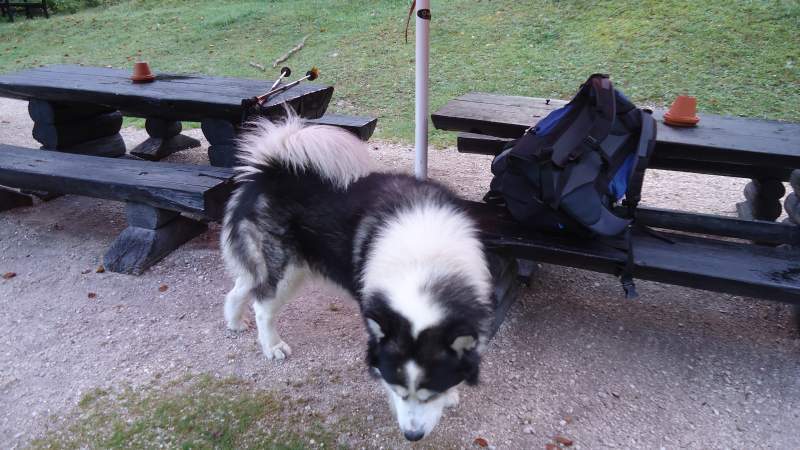 When I arrived at the hut, the guardian was sitting in front of the hut, and his dog was running towards me, it looked frightening but the man shouted at me that I should not worry. He said the dog was normally unfriendly only with other dogs, and it appeared I did not belong to that category so it let me pass. You would not want to mess with this huge dog. I asked the guardian for a coffee which I needed so badly after the sleepless night, and he prepared it for me, a typical Balkan-style coffee which is prepared by adding the coffee into the boiling water and let it cook for a few seconds. It was incredibly strong, just as I needed. He did not want to charge me anything. He said he did not have electricity for some reason and he could not give me the receipt. Here, I want to thank him again. From the hut, there is a short walk through the woods and then you start gaining the altitude. This is a simple walk all the time, but the terrain is rocky and very steep. There is only one point higher up with the fixed cable but this is doable without the ferrata equipment. Though I had it with me and used it. Later, on my way back I met a couple on that same place and noticed they did not use anything, just the cable. View down to Krnica valley. Below is the view of Razor (2601 m, on the left) and Prisojnik (2547 m, on the right) which I climbed earlier. 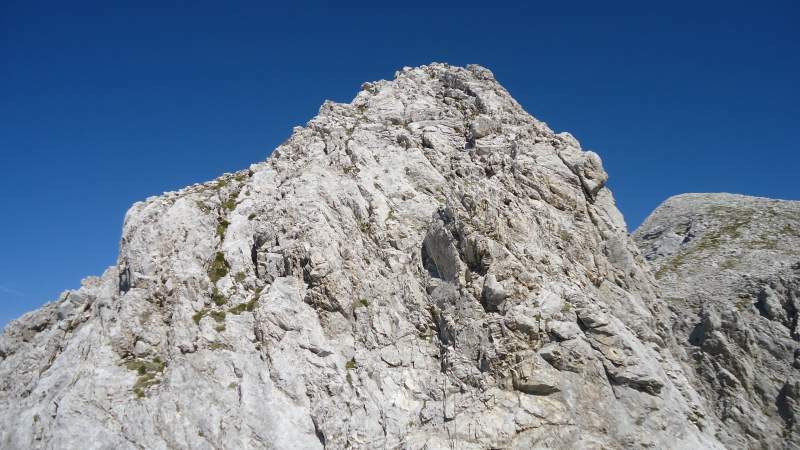 I did try to climb Razor during this trip as well, from Vrata Valley, this was several days later. But after several hours in the rain and well above 2000 meters, I had to give up. So this will be my next destination. 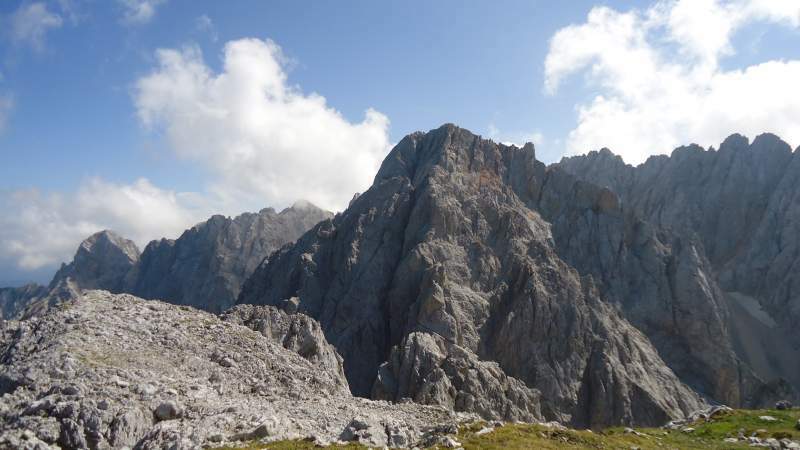 Below is the summit view of Prisojnik (in the center left) and in the distance on the right is Jalovec which I climbed two days later, and farther on the right is Mangart which I climbed ten years earlier. You can follow the links to read more. Prisojnik, Jalovec, and Mangart as seen from the summit of Lipnica. Now, you remember the earlier mentioned Kacji Graben route? 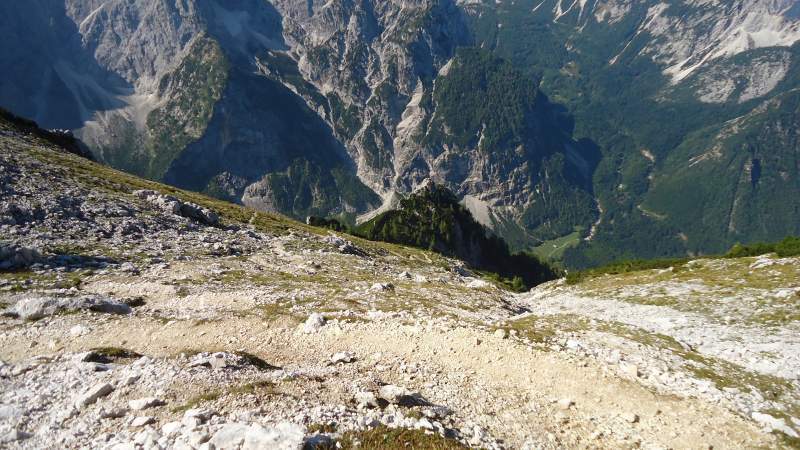 Well, it comes from below to the area which you can see in the Spik picture with lots of scree, so you realize that it is very steep in this upper part. 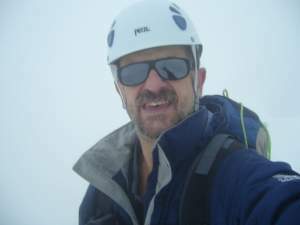 I stayed on the summit quite some time because I was tired and sleepy, and later descended the same way. Clouds were coming very fast, as you might realize from the picture above and I was not in a mood to continue to Spik, I was simply too tired to compete with clouds. Spik will wait for the next season. From the description above you already have some idea about what you need. This is an 8 – 10 hours tour so take some food with you unless you plan to have a meal at the hut. Any hiking boots will be fine, it is best to have a hard sole, the terrain is rocky and tough. I am talking about the snow-free conditions of course. As for the cable section, you have seen it so decide yourself (note it looks steeper in reality). If you are not familiar with the Alps, then remember this – even if the sky is clear when you start, you can have rain on the summit in the afternoon. So better read my text about what to wear for summer in the Alps. It is better to be over-equipped than unequipped. If you need anything from equipment, visit my Equipment Page and you will find detailed reviews of the top rated stuff for such adventures. 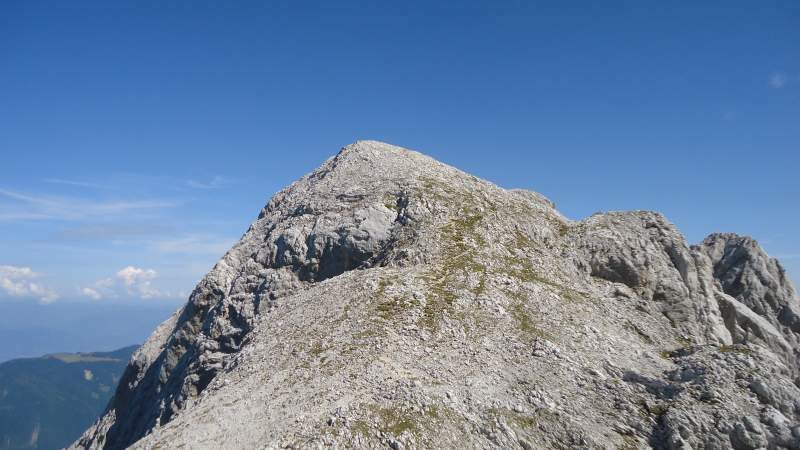 The summit of Mala Ponca in the east direction. Regardless of from which side you come, Vrsic Pass should be your destination. 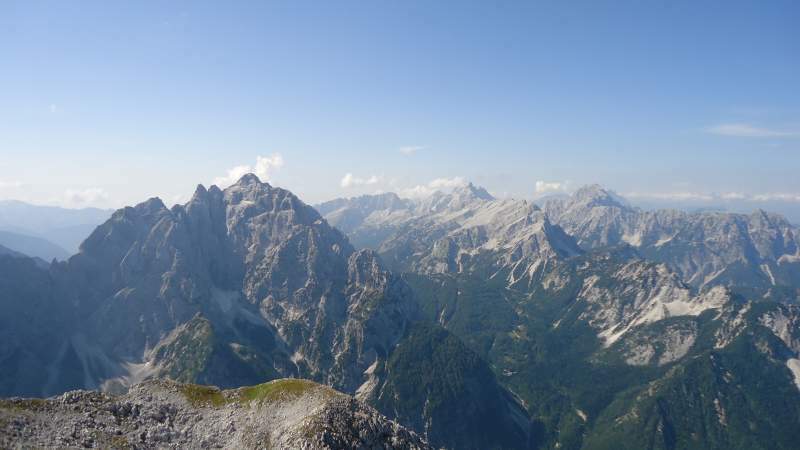 As for the cities, on the north, you have Kranjska Gora and on the south this is Bovec. Here is the Vrsic Pass map so you can zoom it in and out to see how to get there. You will be able to see the Lipnica route on the map if you zoom in enough. The mentioned car parking is on the north side of the pass. 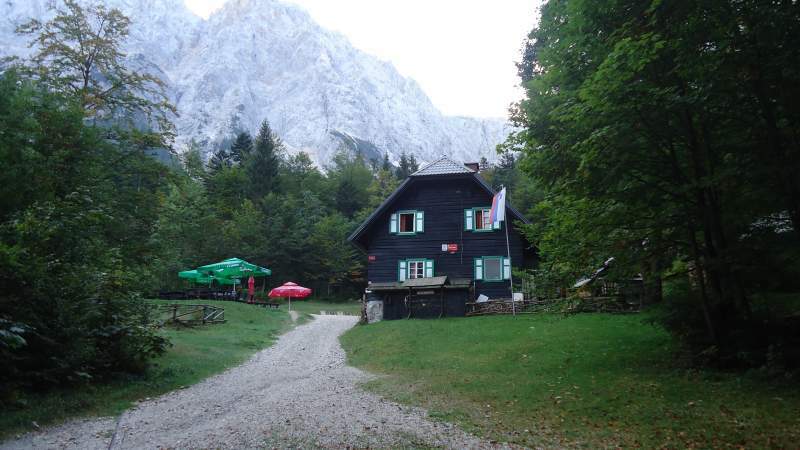 I already mentioned the Krnica hut which is the closest to the route. But on the road to Vrsic Pass and on the Pass itself you have at least 5 mountain huts. Just to know, you will not find such a concentration of huts anywhere else in the Alps. Please visit my page about Vrsic Pass for a bit more information. So climbing Lipnica was a pleasant day for me, and hopefully, I was able to show you why this was so. The day was perfect but surprisingly nobody around, I met only two people on the way back. I already mentioned my failed attempt to climb Razor (failed because I trusted the weather forecast that the rain would eventually stop). So I plan to be there again next season, and Skrlatica will also be on my list. Stay tuned there will be more stuff from that area.